UMK-2KM set is intended for strapping wheeled vehicles on a flatcar. UMK- 2KM set consists of four metal folding longitudinal supports and four transverse all-welded supports. They all have welded pins, which, when run over vehicles enter half of platform. To set UMK – 2KM one unit of wheel machinery of 24tn is attached, which fix on flatcar from transverse and side displacement. 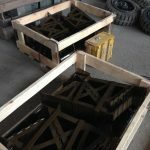 It is a reusable interior packing for attaching freight on a flatcar. Set products of UMK-2 KM must have protective paint and laquer coating green color. 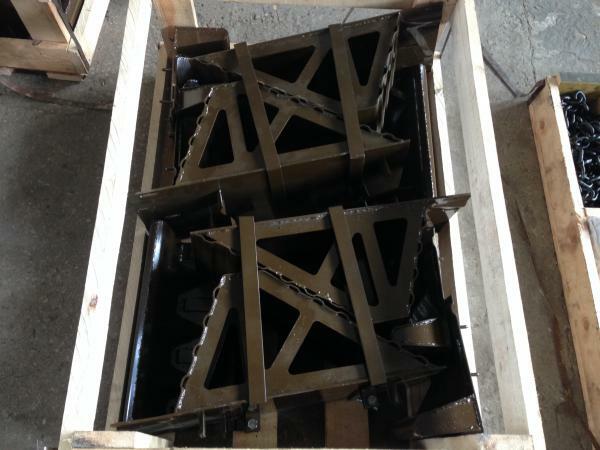 For storage and transportation set is packed to 2 thrusts of each type in one package, as it is showed at picture 1. Two packages of UMK-2KM set are stacked in shipping box. 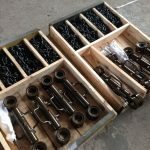 Every supports package is tightened with two packing staples, consisting of P-shaped staples with thread at the ends and plates, tightened on a thread with nuts. Longitudinal support for transportation and storage is folded – support is fitted in a frame, creating a compact form. For right and safe placement and strapping of freight on flatcar with the use of supports UMK-2KM set documentation must include: – working drawings, passport, operation guidance (overhaul periodicity (checking, lubricants, supports repair), information about possible failures and ways of their elimination, instructions of handling safety and operation, as well as storage regulations).